A manual test station shall be replaced by a modern and easy-to-use measuring system. The goal is to improve the accuracy of the measurement and to avoid errors which occur when measurement values are entered manually. The diameter between the gear teeth shall be measured. Therefore the gear wheel is put on a measurement table with a ball for stopping. On the opposite side, a spring-loaded ball and an inductive measurement sensor are installed. The diameter between the fixed ball and the sensor is detected by the Ethernet length measurement system MSX-E3701. Then the measured values are calculated through an integrated logic and classified in 4 predefined categories (tolerance range). 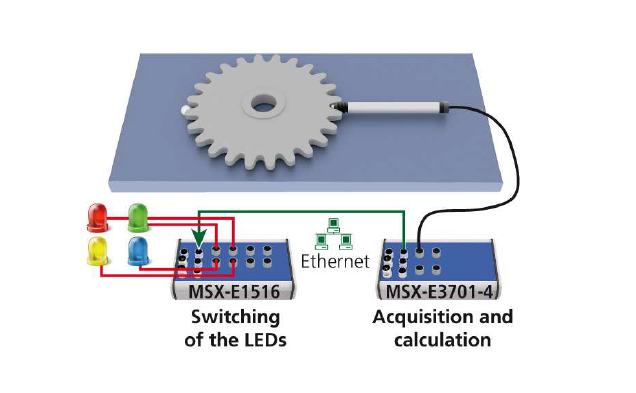 The measurement result is displayed with an LED on the digital Ethernet system MSX-E1516.